No, Don’t Call Me a Crook! is not a posthumous book by Richard Nixon. It is instead a memoir, circa the 1920s, by a Glaswegian marine engineer named Bob Moore. He is, by his own admission, a thief, a liar, a con man, and certainly a raconteur. He sailed around the world seven times or, more accurately, drank around the world. Bob Moore is like the uncle one likes to talk about but hardly wants to see for more than a day or two. 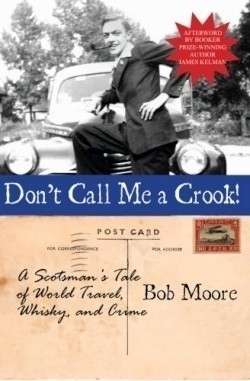 There are two unknowns in this delightful and anecdotal book: first, no one, including the publisher, knows for certain who the real Bob Moore was, although a woman in Essex, England, reports she’s the author’s granddaughter. The other unknown is just how much of these wild adventures the reader is willing to swallow. There’s a lot of misty storytelling going on in these voyages. Moore’s not kidding. After working as an engineer on a boat to New York, he rattles off anecdote after anecdote about his escapades, from stealing diamonds to conning older women out of their jewels. After a few successful attempts at rum-running (remember, this is the Prohibition era), he decides to use his engineering skills again and hops on a freighter for South America. Then it’s off to China. One of the more hilarious parts of the book are the excuses he makes for himself to justify his criminal activity. Moore would be a delightful character in a book that is rampant with characters except for one thing: he has killed two people during his extended romps. As he glosses over that, we begin to see him in a different light. Don’t Call Me a Crook! is worth the read and the laughs, but there is no true narrative line. As a book of anecdotal information, funny or not, it is perhaps best consumed in small doses, with intermittent pauses to consider, sometimes with relief, the space between Mr. Moore’s life and one’s own.